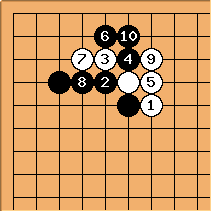 Black here may not be much played any more; but it is clearly an interesting attempt to gain early influence. It is clear enough that this result is satisfactory for Black: Black's stones are working more efficiently than in a well-known joseki . 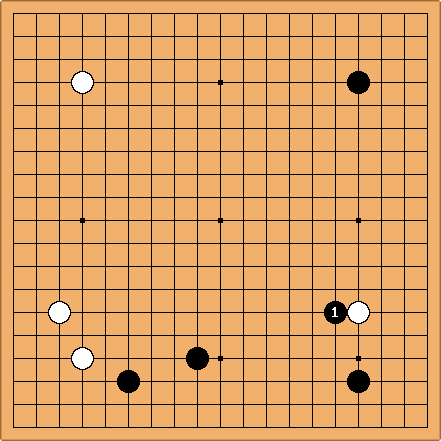 In order of apparent popularity, White's replies from pro games are a, b, c (more common) and d, e, f (less common). 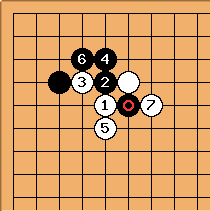 Since Black is trying so hard to take up an influential position, some sort of pushing battle here would be quite natural. 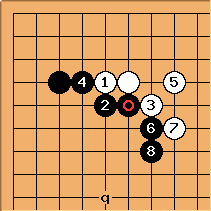 This is nearly a one-way street until White 7 (Kitani once played 6 at 7, allowing White central influence with a ponnuki; probably a Kitani joseki.) 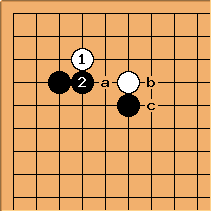 Next Black a or b; Black c was tried by Go Seigen in 1942. 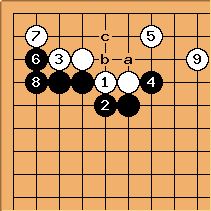 If Black now just extends the fighting becomes large-scale and Black has to decide when to play hane, considering that this is pushing along the fifth line. 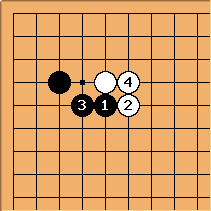 This is from Yamabe Toshiro-Go Seigen 1953-04-12 (colours reversed); Go Seigen played hane at the head of six stones and Yamabe cut. 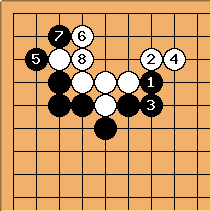 If Black plays hane at once, there is a clear joseki continuation this far, with White's hanging connection to the second line as good shape. After that this corner may be left. 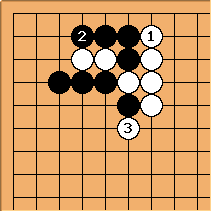 After White 1 here, Black always plays 2 and then White a, b or c: the last of these may not be joseki. 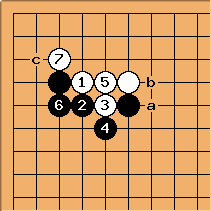 In the first case, White has bad shape; this is the old line in which both players use shape plays, but Black has the sequence Black a, White b, Black c remaining, a good example of aji. Therefore White may vary at 5. This trade-off is what happens most often. 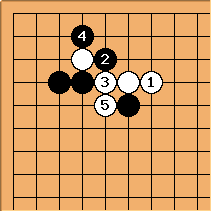 This is the major variation in this case, with Black taking a big corner. 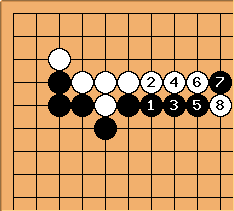 This is the expected completed joseki, with Black's profit and sente set against White's wall. White would need a good ladder for this. This is likely to transpose into the position of the second diagram on this page. 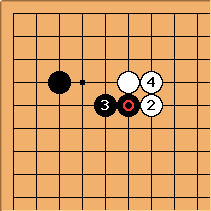 After that the point p is good for both from the point of view of shape; but tenuki is seen too. Pushing in the centre may happen later. Unusual but interesting. 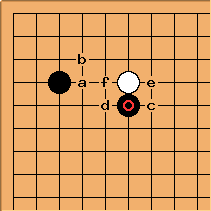 This shape occurred in a couple of games from the 1930s, with White immediately playing at q to reduce Black's influence.